Branded cookies There are 5 products. Differentiate yourself with my branded cookies! 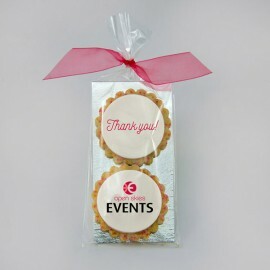 Have your company logo or messages printed on my gourmet vanilla shortbread cookies with edible ink. These chic corporate gifts will be appreciated by your customers, employees and business partners. These personalized shortbread cookies duos, branded to your colours fit very well with your budget and will definitely charm those who receive them! 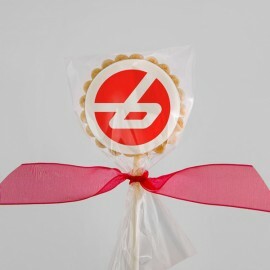 Perfect to print your logo and a message on the same cookie package. Here are some examples of corporate shortbread cookies duos. These 4-pack of personalized shortbread cookies (50 mm)with edible printing, branded to your colours fit very well with your budget and will definitely charm those who receive them! Here are some examples of corporate shortbread cookies 4-packs. My corporate gift boxes filled with my chic shortbread cookies branded to your colors (printed logos or messages on my homemade fondant) and wrapped by a personalized sleeve, will leave your customers open-mouthed!Available in 8 or 18 cookies box. Here are some examples of corporate gift boxes, some of them for Christmas time. 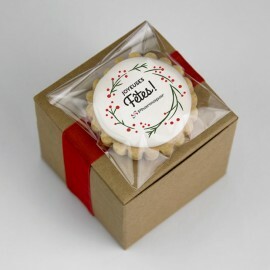 These cute boxes containing 6 big shortbread cookies (vanilla & chocolate) are decorated with a shortbread cookie decorated with marshmallow fondant with your logo on it.Possibility to have a personalized label on the box rather than the cookie on stick.